I spotted this chair in the back of a Goodwill store. There were various miscellanies items piled on top of it, and It involved quite a bit of work to break this chair free. 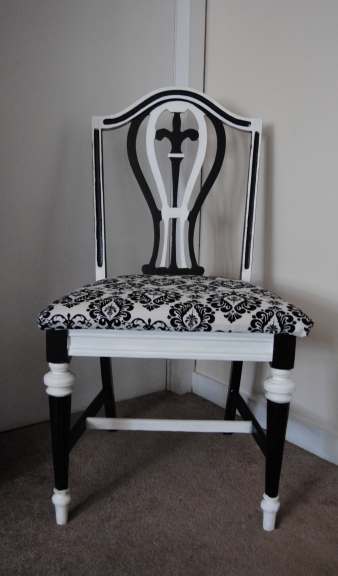 I was attracted to the chair design ( The chair featured a fleur de lys) and I loved the detail. The chair seat was in very rough shape and it would require re-upholstering. The overall chair frame seemed like it was in ok shape, and I thought enough of this chair to assume the risk. The chair was priced to sell at $3.99. When I got it home, I ripped the blue material off the seat and discovered the seat was broken and could not be repaired. Now, I had to salvage another chair in order to repair this one! My husband and I kept our eyes open for any “curbside” or “free” chairs, I prefered to use a free chair and not purchase one, but months went by until I found a freebie chair that would be perfect, A lucky find at a thrift store. The chair seat would turn out to be a perfect replacement, and I have future plans to upcycle what’s left of the chair frame. Stay tuned! First, I cleaned the chair, and primed the chair frame with 2 coats of a white latex primer. 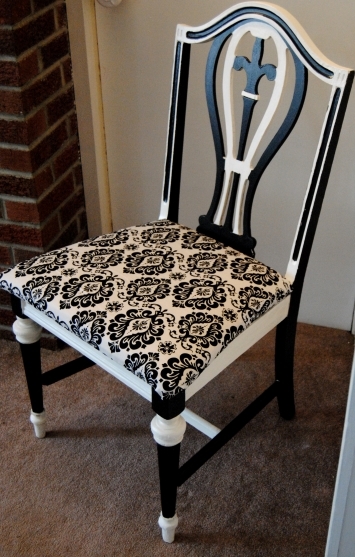 Once the chair was dry, I began to paint it in a white and black color scheme. 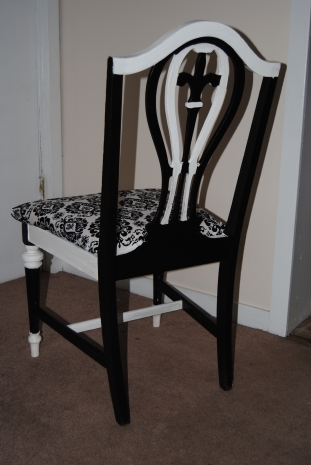 I used black and white acrylic paints to paint the entire chair. This chair was quite a challenge to paint. The chair had a lot of cut-ins, and detail, and required a lot of patience when it came to the paint brush. I sat the chair in front of the fan until it was dry, and then added a layer of Mod Podge overtop to seal the chair. It dried nicely. Now I was ready to re- upholster the chair seat. 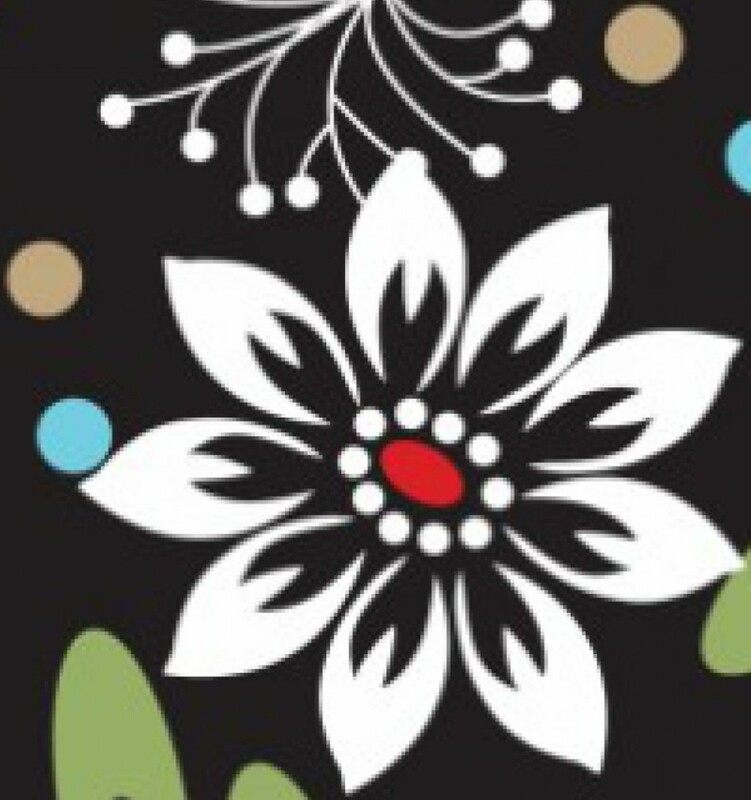 The original fabric I chose was a black fabric with white roses. When I placed it up against the chair, I despised how it looked! So, It was back to the fabric store to pick out another style and I went with the Elegant look of Damask. I used less than a yard of material and cut and traced it to fit the new seat, leaving extra material for underneath the seat. I used an upholstery stapler and carefully stapled the material to the back of the chair seat. Once I was done I screwed the seat back on to the chair. This chair was not short in challenges, but in the end it was worth it. Looking at the finished chair, I would say this chair turned out to be worth the risk, and a broken piece received an elegant new lease on life! Wow! Thank you! I really can’t thank you enough for all the support you have offered to me and my humble little blog! hugs!